"I'm not Goku or Vegeta, I'm the instrument of your defeat!" "I'm not Goku or Vegeta, I'm the instrument of your defeat!" The above info came from Big Hamster, and was edited by yours truly (contact me). The image came from Gogeta. Gogeta is Vegetto's "Good-side brother" (notice how that's in quotes, people, I know they're not really brothers, it's just an expression, so you can stop emailing me about that). 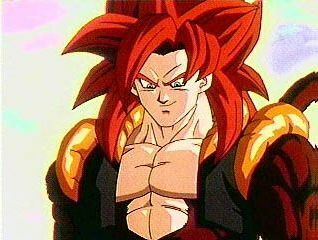 Gogeta is older than Vegetto because he became before Kakarotto lived again. Notice that Gogeta is the first dead fusion around. He was made to kill Janemba, a Soul demon. Unlike his "brother", Gogeta kills enemies really fast. 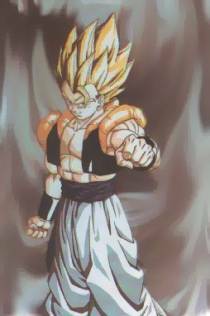 Gogeta also fights Li-Shenlong in GT, but because they spent more energy in SSJ4 state, the fusion only lasted 15 minutes instead of the typical 30 minutes, and thus he lost.